Welcome to the analysis of Hannibal Rising. Buttons at the bottom of each post enable navigation through the parts of the analysis. Regarding the appearance of possible anti-Semitism on this blog, please see the 'Disclaimers' section near the bottom of this page. We begin the analysis with a brief description of the film, followed by a summary of the plot up to the point of Hannibal Lecter's childhood escape from the Lecter family's hunting lodge. 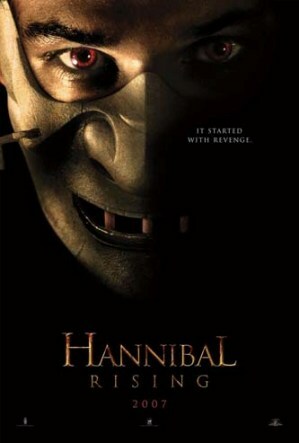 Hannibal Rising is a 2007 horror film and the fifth film of the Hannibal Lecter franchise. It is a prequel to Red Dragon, The Silence of the Lambs, and Hannibal. The film is an adaptation of Thomas Harris' 2006 novel of the same name and tells the story of Lecter's evolution into the infamous serial killer of the previous films and books. The film was directed by Peter Webber from a screenplay by Harris, and was released in 2007. It stars Gaspard Ulliel, Li Gong (credited as Gong Li), Dominic West, and Rhys Ifans. In 1941, an eight-year old Hannibal Lecter lives in Lecter Castle in Lithuania. Hitler's invasion of the Soviet Union turns the Baltic region into part of the bloodiest front line of World War II. Hannibal, his younger sister Mischa, and their parents travel to the family's hunting lodge in the woods to elude the advancing German troops. The Lecter family (lower right) approach their hunting lodge. Later, the Nazis are driven out of the countries soon to be occupied by the Soviet Union. During their retreat, a German plane first attacks, then crashes into, a Soviet tank that had stopped at the Lecter family's hunting lodge looking for water. Due to the explosion and fire from the crash, everyone is killed except Hannibal and Mischa. A German plane crashes into a Soviet tank, in the front yard of the Lecter family's hunting lodge. As with the other Hannibal Lecter movies analyzed on this blog, there is much in the way of underlying meaning in Hannibal Rising, and the movie contains a 'hidden plot' as well. We will begin exploring these aspects of the film, in the next part of the analysis. a. Poster for Hannibal Rising: The poster art copyright is believed to belong to the distributor of the film, The Weinstein Company / MGM, the publisher of the film or the graphic artist. b. Wikipedia, 'Hannibal Rising (film)'. Web, n.d. URL = https://en.wikipedia.org/wiki/Hannibal_Rising_(film).